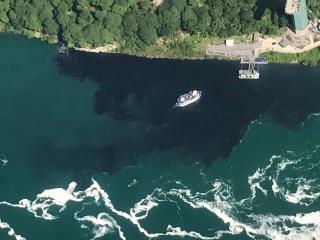 (Newser) – On July 29, tourists were understandably bummed when stinky black water—a combination of wastewater and sewage—was discharged right next to the Maid of the Mist and Rainbow Bridge docks at scenic Niagara Falls, the Buffalo News reports. Now, the state of New York is fining the Niagara Falls Water Board $50,000 for the incident that Gov. Andrew Cuomo says was "inexcusable" and has tarnished the landmark's reputation around the world. In addition to the fine, the Niagara Falls Water Board must get state approval for all future discharges and complete mandatory retraining of all employees, WGRZ reports. Black discharge. That's going to kill the romance. It's only a problem because tourists saw (and smelled) raw sewage being dumped. This means that they dump raw sewage at 2am and somebody screwed up.